Usually when I make Greek lamb I make potatoes. 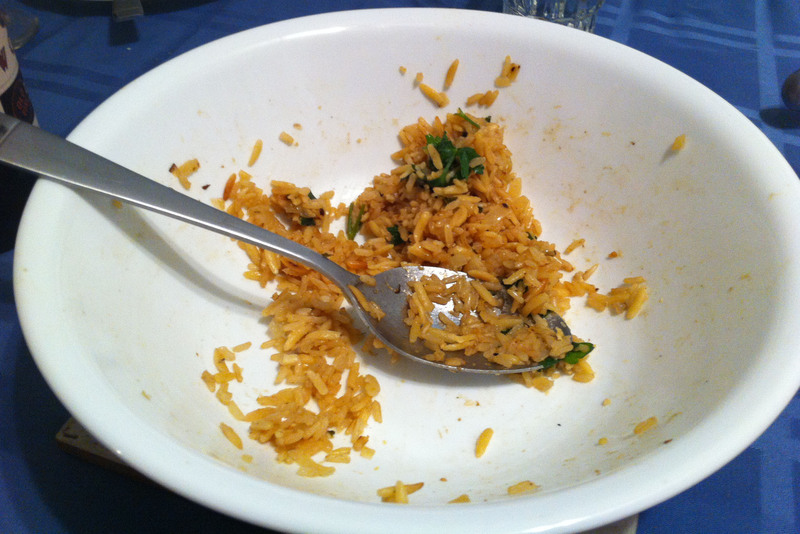 Last Easter, I decided to try a Greek lemon rice pilaf recipe. It was good, but for my sister Karen I thought I could make it better for this Christmas Eve’s dinner. Jan doesn’t like white rice, so I switched to brown. For my family there are never enough onions. The original recipe did not contain garlic, but who can make a Greek dish without garlic and pepper? After Dinner Note: This recipe makes enough pilaf for 6-8 people, we had 5 in attendance. A before and after picture tells you all you need to know about how this dish was received. Poor Braden got at least a taste of the pilaf. Fortunately, being related to my sister, he really likes lamb. 1. Melt the butter in a medium saucepan and sauté the onion until translucent and just starting to pick up some color. 2. Add the rice and orzo and cook for 4 minutes, stirring frequently until the orzo is well browned and the rice is well toasted. 3. Add the garlic and sauté for 30 seconds more. 4. Add the chicken broth, lemon juice, zest and pepper. 5. Bring the pot to a boil and then reduce the heat and cover. Tip: To get a good seal on the pot, cover the lid with a thin clean dish towel. Stick the ends of the towel through the handle to keep them away from the heat. 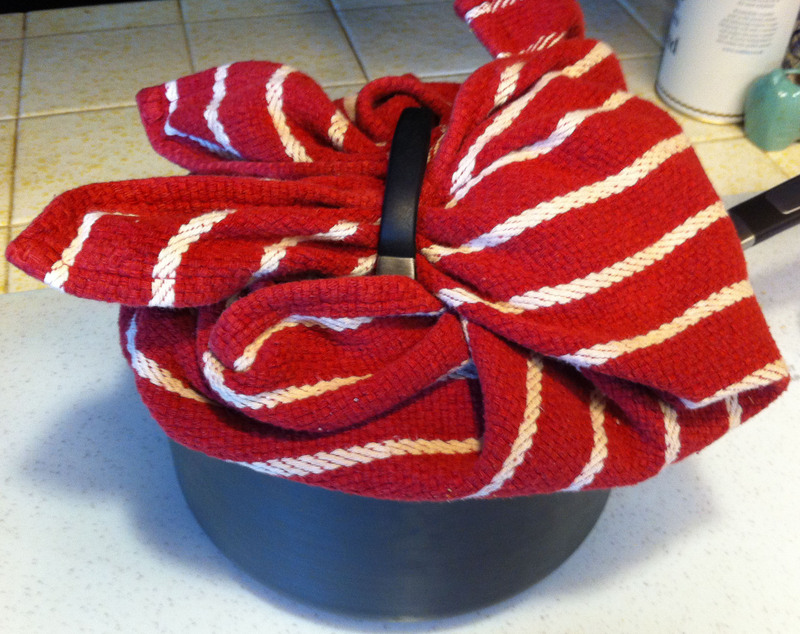 If your lid has a knob handle use string to a rubber band to tie up the ends of the towel. 6. Simmer for 30 minutes or until rice is tender and liquid has been absorbed. 7. 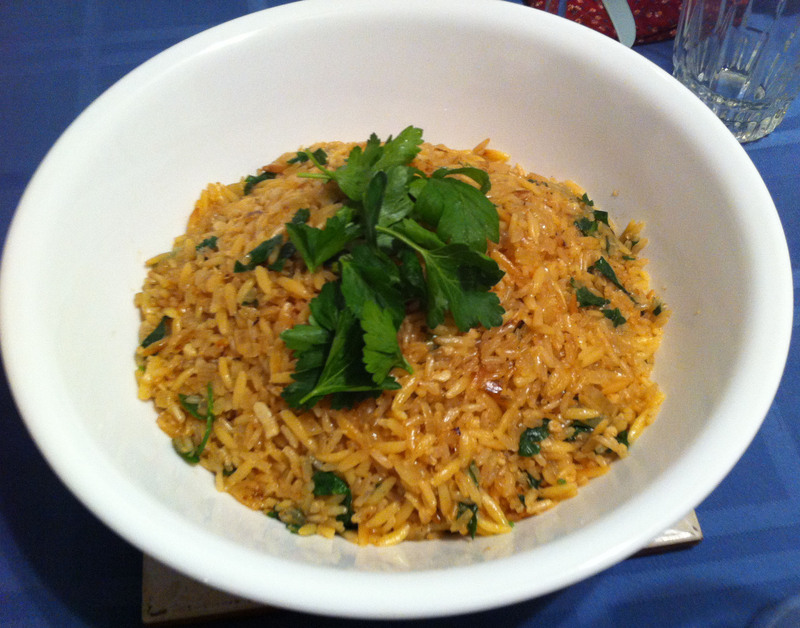 Fluff pilaf and stir in most of the parsley. 8. Transfer to a serving bowl and garnish with the rest of the parsley.